Get your Georgia Tourist eVisa Now! Travelers must have their passport with at least 6-months validity from the date of arrival. What is the Georgia Tourist eVisa? The Georgia Tourist eVisa is a short-term visa that grants the right to enter Georgian territory. There is no need to make an appointment or present original documents to the Embassy or Consular Office. What do I need to apply for a Georgia Tourist eVisa? What is the cost to obtain the Georgia Tourist eVisa? Standard Processing Time - USD 20: 9 business days. Rush Processing - USD 30: 7 business days. Super Rush Processing - USD 50: 5 business days. How long does the Georgia Tourist eVisitor process take? Standard Processing Time: 9 business days. Rush Processing: 7 business days. Super Rush Processing: 5 business days. How long is the Georgia Tourist eVisa valid for? 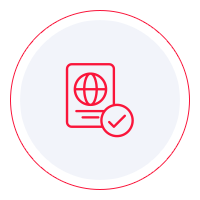 The validity period of the multiple entry e-Visa varies according to Country of Travel Document/Passport. There are two types: 180 days and 120 days, 90 days per 180-day period and 30 days per 120 day period. How long should the validity of my passport be if I want to apply for the Georgia Tourist eVisa? Which countries are eligible for the Georgia Tourist eVisa? How long can I stay with in Georgia with the Tourist eVisa? For the eVisa with a validity for 120 days: You have the right to stay in Georgia up to 30 days during the validity period. For the eVisa with a validity for 180 days: You are allowed to stay 90 days during the validity period. Where can I read more about Georgia? This african hidden gem is a must on your travel list. The beautiful architecture, the flavorful cuisine and the emerald green landscapes are definitely Instagram worthy. The georgians are full of kindness and will welcome you into their cities, as they say: “the guest is a gift from God”. Plan your Georgia trip and be ready to enjoy all the goodness from this small, but beautiful country. Below are some useful links to learn more about Georgia.